Enter coupon code CYBER18 at checkout. Offer expires November 28, 2018. The offer has no cash value and is not redeemable for cash. Not valid on gift certificates, previous purchases or when combined with any other promotional offer. Excludes distributor pricing. About Brock’s Performance : Brock’s Performance leads the way in sportbike innovation for acceleration addicts. From exhaust systems to wheels, this championship-winning company designs, builds and sells more than 3000 products that make it easier and safer for racers and street riders to reach record-breaking results through a never-ending process of research, development and track testing. 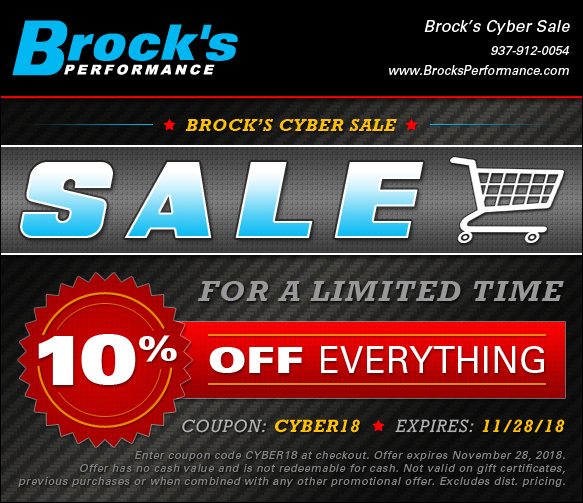 For more information about Brock’s Performance parts, go to BrocksPerformance.com or call 937-912-0054.